The legislature occupies the epicenter of modern democratic system for two major reasons, namely it houses the largest number of elected representatives and secondly, it is the engine room of modern governance as it performs the traditional four-fold tasks of representation, lawmaking, oversight function and constituency services. The demands of modern governance entail that legislative assemblies must sift through several competing expectations and act in the overall public interest. In order to actualize these expectations, legislative assemblies have evolved the committee system to fast-track their operations. Nigeria’s National Assembly has been performing its core mandates through the instrumentality of committees. 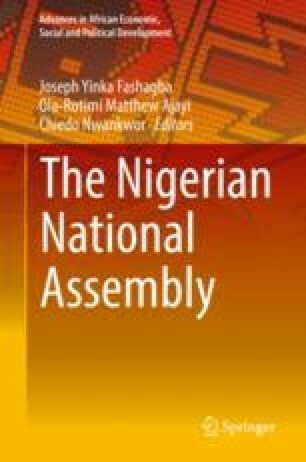 This chapter appraises the committee system in the National Assembly and finds that in addition to its relevance in reducing workload and improving overall efficiency, membership appointments into committees have been used by successive leaderships as prebends to consolidate their tenures. The chapter recognizes that while committees have been embroiled in several corruption scandals which undermine their moral authority to instil integrity in governance, it concludes that the committees have contributed immensely to the development of critical competencies that have aided the overall legislative success of the National Assembly. Lü, X., Liu, M., & Li, F. (2018). Policy coalition building in an authoritarian legislature: Evidence from China’s national assemblies (1983-2007). Comparative Political Studies, (in Press). https://doi.org/10.1177/0010414018797950.